Bo Diaz was a catcher who played for Pawtucket in 1976-77. 1976 - Diaz played in 62 Pawtucket games. He batted .248 and hit four home runs. 1977 - At age 24, Diaz played in 104 games. He played catcher in every single one of them. Diaz placed first in the International League for games caught that season. I hope you find that fascinating, because it took a lot of stats sifting to come up with that. Like, you can't just look up games played by position in a minor league season. 1. 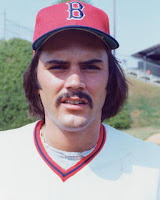 'The Flagrant Fan' blog has a post about catchers who don't walk very often that includes Bo Diaz. I enjoyed reading it and maybe you will, too. 2. Video of Diaz talking about setting up to call pitches and receive them and other catcher jobs. I know my 'Two Things' entries are not really Pawtucket related, but it was slim pickins. Bo Diaz died in 1990 at age 37 while installing a satellite on his rooftop. Wicked sad. You can check out his mural in the middle portion of the first base tower.